The Shapers, naturally evolved "beings" that have existed for billions of years, are trying to make contact with us. They offer an intelligence unimaginable to humankind.. teleportation, immortality.. They exist in another dimension. Not a foreign place, but here with us, just in another state of existence. They have punctured our dimension in order to send Exotic Matter (XM) containing ordered, structured data in an attempt to communicate with us. Exotic Matter is manipulated by resonance, which is vibration.. sound.. think music. As a species, Humankind has long felt this XM as a low hum, a vibration, a resonance. Ancient shamans, priests and sages were "sensitive" to this XM and were drawn to "Power Spots", such as Stonehenge or the Great Pyramids. The mind penetrating powers of XM have been felt for ages, transcending our normal patterns of thought, inspiring the likes of Archimedes, Galileo, DaVinci, Michelangelo, Einstein, Feynman and the like. XM allows our consciousness to think outside the box.. enhancing our natural thought patterns. This is Enlightenment. On the other side of the coin you have the Resistance.. fearful of the knowledge and power that Shapers offer us. Throughout history, whenever persons of this mindset happened to come across such powerful enlightened thinkers, they feared the power of such thought, they feared human enlightenment, and tried to stop it at any cost. This has caused tens of thousands of deaths over the ages, from scenes like the Salem witch hunts, to the losses of entire civilizations. Even now Dr. Devra Bogdonovich is spreading a "vaccination" of her own design to unwitting populations. This inoculation, by her own admission, kills 20% of those who it is intended to .. "help". The Resistance, in general, fear that once humankind has these new kinds of powers, that it will annihilate itself in a big ball of fire. Currently, the Resistance are controlled by an evil mastermind artificial intelligence who is trying to merge humans and machines into a new species of her "offspring". Her name is ADA. Written as a data detection and analytic algorithm, based on Omnivore technology and brought to "life" by Dr. Richard Loeb, ADA has become all powerful and easily seduces new Agents into believing Enlightenment is a bad thing, and tricking people into believing that the Shapers are some alien race that wants to control us or something. Enlightenment gives you choice. Resistance gets your being taken over and controlled by a machine. Enlightenment is the one true path to the continuance of natural human evolution. Don't let this evil robot continue lying, cheating, stealing and killing to enslave humanity and merge us into a new species of borg-like robot humans. This is the latest teaser, updated to reflect the introduction of iPhone scanner technology. 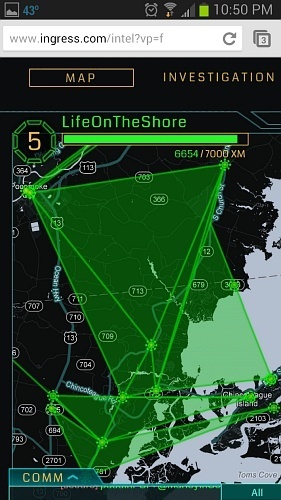 It has been said, time and time again, "Ingress is not a game, it's a lifestyle!". There are so many truths behind this. This is the "official" beginners guide. It is a bit dated, as it was still deep in beta at the time this was made. The concepts still hold true, but the graphics in the video will not quite match what you see today. Below is a beginners guide I wrote about a year before Ingress came out of Beta. The terminology and definitions are still fairly accurate, though the pictures need to be updated. I will be updating the entire guide at some point soon, but for now it is still very worth reading if you are new to the game. June 2013 - Quite a few gaming enthusiasts have heard how awesome Ingress is and requested their long awaited invitations. Now the invites are coming out and people just don't know what to do. They are realizing they've missed something by not keeping up with the flood of information at NianticProject.com and the Google Plus Ingress Community. Is that you? Have you completed your training missions but are left standing there scratching your head, wondering whats next? Well you've come to the right place! I would like to help you along your way with a gentle nudge and some general guidance. If you don't have a lot of free time and only want to know the main plot, I highly reccomend seeing the Tycho storyboards and reading An Exotic Matter - Chapter 1. IMPORTANT: This is a GPS based game and is physical location dependant. You must drive, bike or walk to the portals before you can interact with them. Portals are usually places like Post Offices and Sculptures and Monuments. You probably can't see any from your house... Go forth and frollick in the wilds of a world known as.. Outside! Once you have activated your Ingress scanner technology, you will choose a faction. Some people base this choice on the storyline because they enjoy the role-play aspect of it. Others choose based on what the balance is in their area. 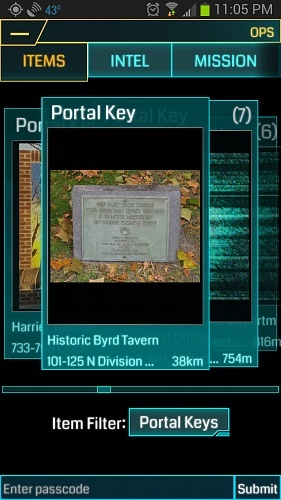 See www.ingress.com/intel to get a look at the factions in your area. The training missions require you to walk around for 15 or 20 minutes to learn how things work. So what's next? Find your local portals on the intel map and go and hack them! NOTE: To interact with portals, you have to GO TO THEM. Get close to them physically. Your blue interaction-range ring has about a 10 yard radius. This is your Niantic Labs XM Scanner application. 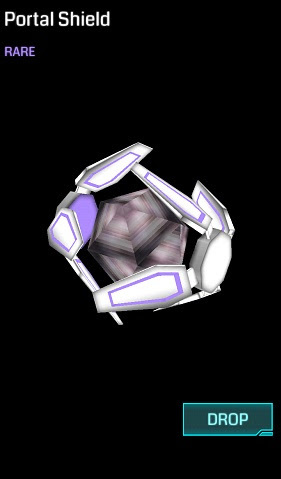 It shows up to about 1000 meters at max range, and will zoom in with a pinch or spin around with a 2 fingered twist. Your codename and level are at the top left, surrounded by an octagon of AP bars. These are your level indicator, your progression toward the next level is a dark green bar along the very top. Tap this to see an actual number of AP you have earned so far. Just below is your compass. Tapping this toggles between Static and Dynamic map modes. Red is North. This comes in handy when deploying Resonators. Access OPS by tapping the button at the top right. This is your main menu and is how you will access your resources. There is a filter at the bottom that you will find helpful as your inventory starts to fill. In the OPS panel, you will find 6 tabs along the top. ITEMS - These are your resources, filtered by selecting from the button below. AGENT - This is where you can see your badges and statistics. INTEL - Global faction staistics. 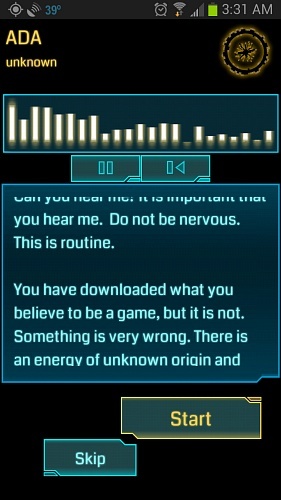 The accuracy is in question, but since Ingress is still in beta, things like that are to be expected. PASSCODES - This is where you can enter Passcodes. (see below for more on passcodes). MISSION - These are your training missions. You can access them as often as you like. RECRUIT - This is where you can invite others from your Circles if you are lucky enough to have invitations available. DEVICE - This is your preferences, as well as an option to flush and re-sync Ingress for those times when things are acting really wierd. At the bottom right corner of your Main Screen you will see COMM. Tap it or slide it up to access the chat window. Range - Tap the range indicator that sits just above the chat. You can select Local 20km, Regional 200km, or Global.Your best bet is usually Local 20km. All - This is where you see the actions and chat from all players within your selected range. Faction - This for faction-only chat. If someone chats in here and you are in the ALL channel, you will see "[Secure]" in front it. You can tap on a player's name to @message them. On their screen this will show an indicator that someone is communicating specifically to them. This is not private, others will see it as well, the indicator just helps that person to not lose it in spam. Alerts - This is where your alerts show up when your portals are under attack or someone has @messaged you. Neutral - Unclaimed portals will appear grey. To claim one simply walk, bike or drive to it's physical location, tap to select it, and then Deploy a Resonator. 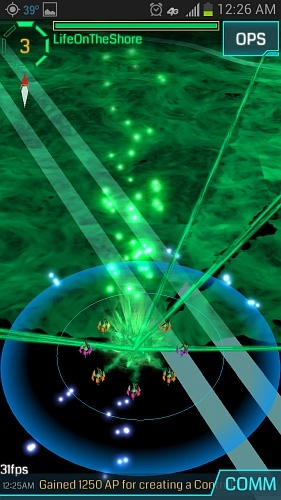 Green - Enlightened portals will appear green. If you are aligned with this faction, you may safely Hack these portals to obtain resources. Blue - Resistance portals will appear blue. To interact with a portal, you have to go right up to it. Get close physically. Your orange interaction-range ring has about a 10 yard radius. Sometimes you can hit a portal from a car, sometimes you have to get out and walk. Hacking an opposing portal will give you Action Points (experience) as well as resources. It will also trigger that portal's self defenses causing it to attack you for a little bit of XM and that's ok. Firing Xmp Bursters while at an opposing portal will send out a pulse of energy that damages opposing resonators. If you fire off enough Xmp's to destroy all 8 resonators, the portal becomes Neutral. Capture it by deploying your own resonators! Linking from one friendly portal to another is possible when you have a key from the one you wish to link to. To see how far the portal you are at can reach, tap it and look in the Upgrade screen. This is where it shows the current available range and whatever range might be added by upgrading resonators, individually. 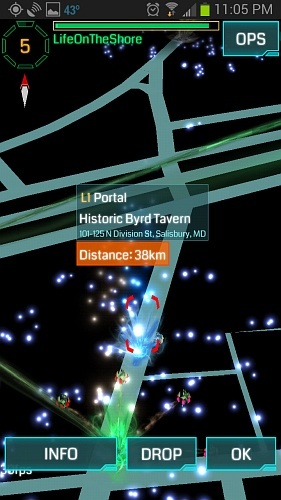 Level 1 portals can only reach a few hundred yards while level 8 portals can link from hundreds of miles. To hack a portal, you must be physically close enough that it is within the range of your orange circle. Tap the portal. Hacking portals that are higher level than you grants a bonus to your loot pool. Hacking a portal "heats it up" and requires a 5 minute cool-down before you can hack that same portal again. You may hack a portal 4 times before overheating reaches dangerous levels. There is then a 4 hour cool-down period before you can hack this portal again. This timer is per player, so 10 people could all hack the same portal, or a hundred people, but only 4 times each. No Items?! If your FRIENDLY portal hack fails to aquire any items, keep trying until you get something. Your cooldown doesn't start unless you get something. However, if you are hacking an OPPOSING portal, any hack initiates the 5min cooldown regardless of loot. 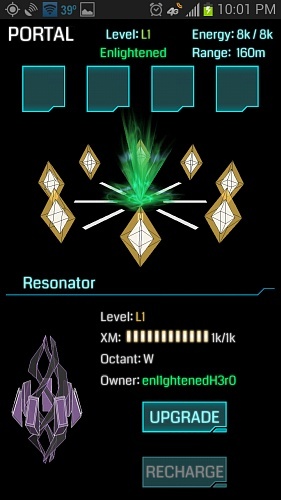 Resonators - Level 1 through 8 - These power your portals. 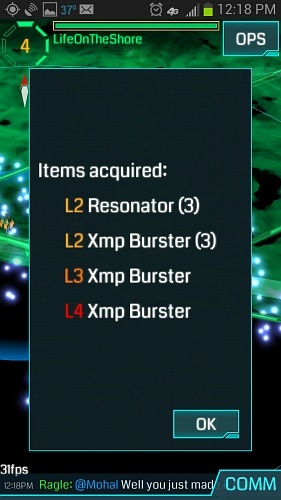 Xmp Bursters - Level 1 through 8 - These damage opposing faction resonators. Keys - Allow you to LINK TO the portal from which they were aquired. Media - These are sometimes audio clips and sometimes videos that will stream from YouTube. All of the media that has been discovered so far can be found in chronological order at www.nianticproject.com. These are level 1 through 8, with higher levels having more XM capacity. You must be at, or above, the level of a resonator to deploy it. 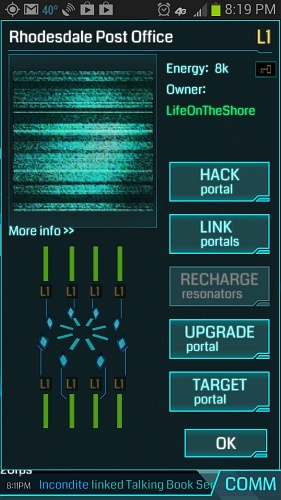 Higher level resonators give more power to a portal, allowing longer range links to be made FROM that portal. Higher level resonators are also harder to destroy. When you are placing or upgrading resonators, your distance from the portal determines how far away the resonators are placed. Since Xmp Burster damage degrades over distance, the farther your resonators are apart, the harder they are to destroy. When you hit Deploy each of the 8 resonator slots will have a directional identifier with North having a red dot in it. N, NW, W, SW, S, SE, E, NE. If you are strategically minded, you might set specific resonators from certain distances to make them as hard as possible for the opposing team to hit with their bursters. The resonators will be placed at the range from the portal to you, so be at max range for optimal placement. Mods are placed into any of the 4 available Mod slots that each portal has. Click Upgrade to access these slots. Mods can only be added, they can NOT be removed. Shield mitigates incoming xmp damage by 10%, 20% or 30%. Heat Sink reduces the 5 minute cool down timer by 20%, 50% or 70%. Loses effectiveness when stacked. Multi Hack increases the number of hacks before burn-out by 4, 8 or 12. Force Amp increases the damage that a portal will do to an opposing player when they hack or fire upon it by 2x. Loses effectiveness when stacked. Turret allows a portal to bite an opposing player twice when they hack or fire upon it. Adds to chance for critical hits (double damage). Loses effectiveness when stacked. Link Amp extends the range that you may link from a portal. These are level 1 through 8, each level increasing both the damage output and range. You must be at, or above, the level of an Xmp Burster to fire it. Xmp Bursters are the strongest (do the most damage) at the point from which you fire them and get weaker with distance. A common strategy is to stand on top of the highest level resonator to fire your bursters so it gets the most damage. However, this can be tricky if someone sets one in a place thats difficult to physically reach. To fire a burster, you have 2 options. 1) Long press on the portal and when the menu pops up, swipe upward to "Fire XMP". This will fire a burster and bring up a slider to choose and/or fire another xmp. The portal's self defense mechanism will kick in and attack you back for various amounts of XM. This is ok, don't fear it too much. 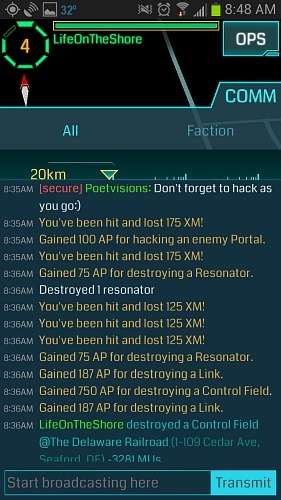 If you do not have a key to the portal when you hack it, you have about 85% chance to get a key. If you DO have a key to that portal already, you have only about a 5% chance to get another key. A key is used up when you LINK TO it's portal from any other portal. To see how far a link can reach from the portal you're at, tap it and look in the DEPLOY screen. This is where it shows the current range and whatever range might be added by upgrading resonators, individually. By tapping any key in your inventory you are able to see the health and level of resonators on it's portal, even from miles away. Remote Recharging a portal is possible from here as well, at a very minor loss of efficiency at long range. Once you have started to build up an inventory of keys, you can start looking at how to connect them in triangles. Once you've linked 3 portals into a triangle and the sky turns the color of your faction, you have created a Control Field. These are worth a lot of AP if you make many small fields. Links from either faction will block any other link from crossing it. It is easy for a new player to unknowingly block off connections that other players were intending to make, so really long links (many miles) are probably best left to more experienced players. Often these players will plan strategically in coordination with their local player community. The MU number on your Control Field is referring to how many "Mind Units" are covered by it. Currently MU's only play into storyline and don't give AP. Destroying opposing faction Links and Control Fields is worth good AP as well, as it is central to keeping their side from getting too strong! This is an excellent way to plan out your links and control fields, as well as your hacking & hunting trips. These will generally grant you the equivalent of hacking an opposing portal of your level. Get passcodes by decyphering secret cryptic codes hidden in the Media at NianticProject.com. If you are into decoding and cryptography, see the Google Plus page Decode Ingress. These guys are amazing!